INDUSTRY.co.id - Cikarang, Minister of Industry Airlangga Hartarto believes, with the connections of various industrial areas both in Java and outside Java will spur the growth of the national economy. "If all the industrial areas are connected, our economy will be strong," Airlangga said in Cikarang, Bekasi (26/6/2018). For that, Airlangga hopes, the development of industrial parks such as in South Bekasi can be replicated to 100 other regions in Indonesia. For example Jababeka industrial area which proved able to show the multiplier effect of industrialization activity can contribute significantly to Gross Domestic Product (GDP) or Gross Domestic Product (GDP). "With one million jobs created in the industrial estate, its GDP from the entire plant is more than $ 35 billion per year or its per capita GDP of $ 35,000," he said. 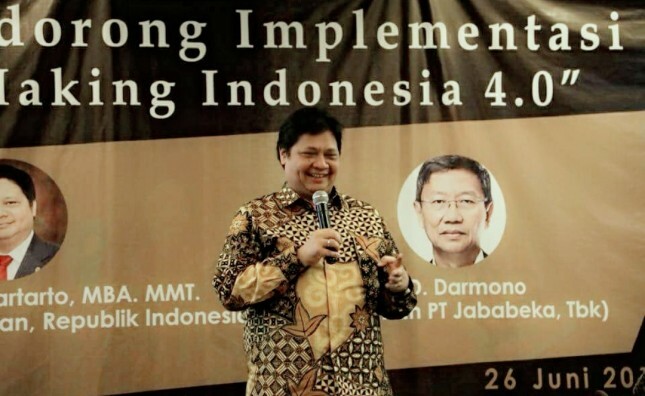 The achievement, according to Minister of Industry, in accordance with the vision of Indonesia's gold in 2045. "Our target, the average GDP per capita of Indonesia could be USD35 thousand," he added. Therefore, the development of industrial estate is also one of the strategies in implementing industrial revolution 4.0. Through the Making Indonesia 4.0 concept, it can facilitate the development of industrial zoning to drive our economic progress. "Moreover, we have corridors in North Java, there are industrial areas in Bekasi, Karawang to Purwakarta, Central Java corridor in Semarang and Kendal, East Java, Gresik, Lamongan and Tuban. also in Aceh, Morowali, Bontang and Bintuni, "he said.